"Our very first small batch, limited release brew. It’s a summer blonde with a twist – literally. You see, we’ve added plenty of dried grapefruit rind along with Sterling and Willamette hops. The result is a refreshing grapefruit aromatic with a clean citrus finish. It’s the perfect patio beer for summer 2011." • A hot summer afternoon! 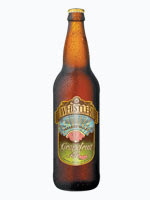 Paradise Valley Grapefruit Ale is a seasonal beer, available only from May – September. I'm totally looking for this one today-- sounds awesome!